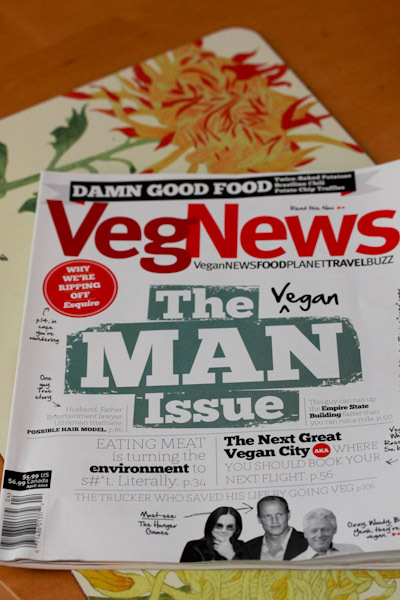 I’m really enjoying the current issue of VegNews, The Man Issue. 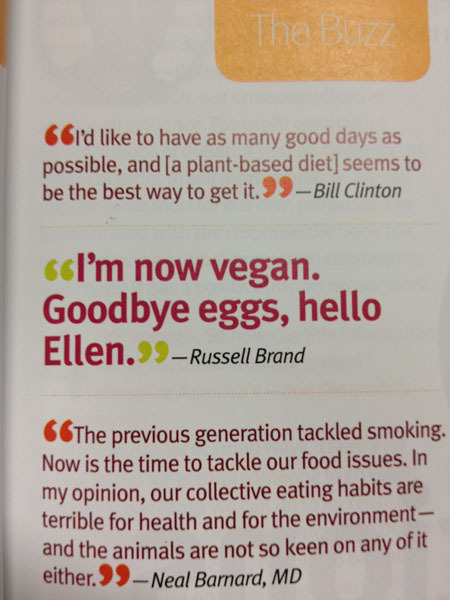 And a great article on vegan men with an impressive list of them, like Ozzy Osbourne, Bill CLinton, Russell Brand, and even Steve-O. Also a little disturbing to read about fast food meat marketing targeting men as the “manly” diet – pleeeeease! But encouraging and positive to read about the rising backlash to those types of campaigns. This week at work has been nuts as I expected, trying to keep up with half marath0n training has been a struggle when I’ve been so burned out after workdays. 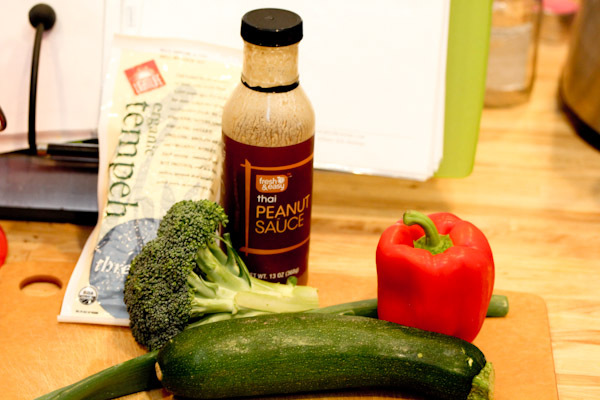 Meals the last few days have been all about simple, like a peanut sauce stir fry I did using Lightlife Tempeh and plenty of veggies. 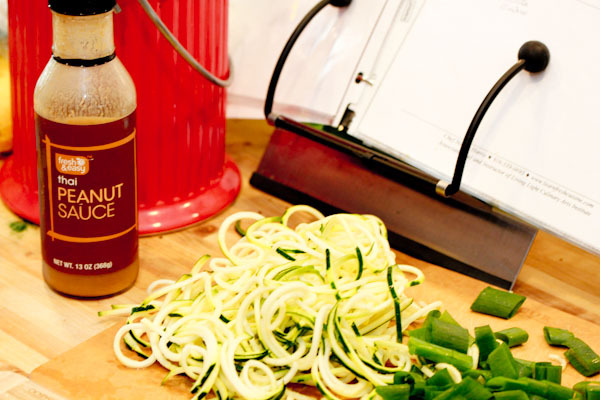 I used my spiral slicer on the zucchini to make fun veggie noodles for it. 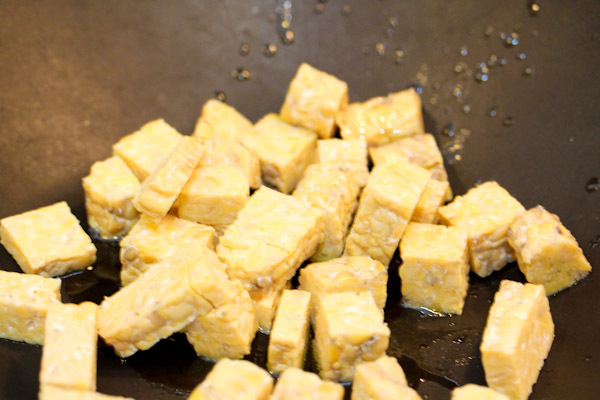 And crisped up the tempeh cubes in the wok first before adding the veggies and sauce. 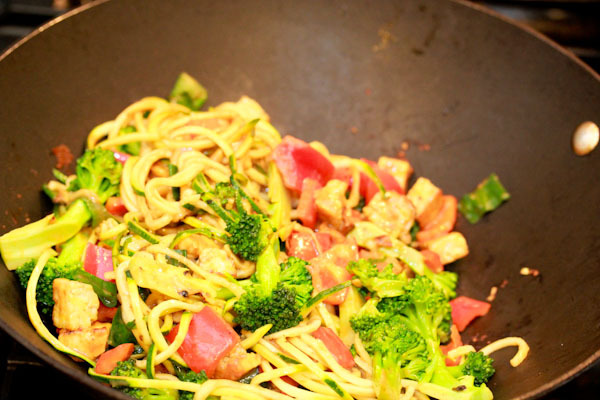 The finished product was a colorful masterpiece only taking about 15 minutes to prepare. 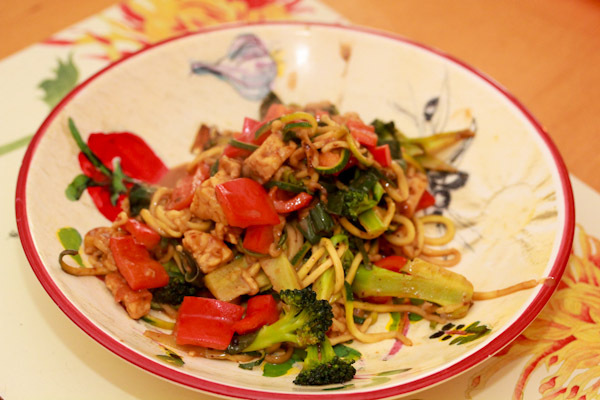 And Miko begged aggressively for his own serving, he actually likes tempeh and zucchini noodles. 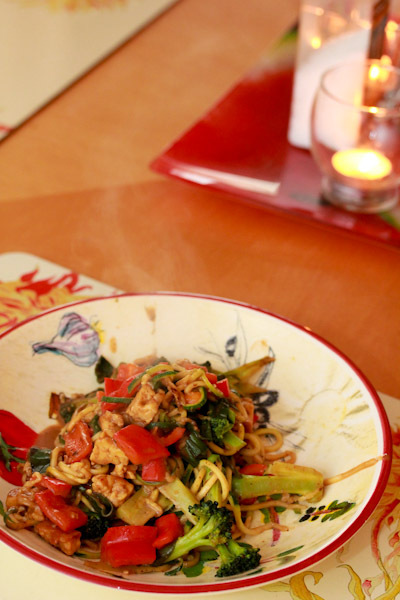 Yesterday I was having a carb loading day for some reason, must have been preparing for today’s long run! 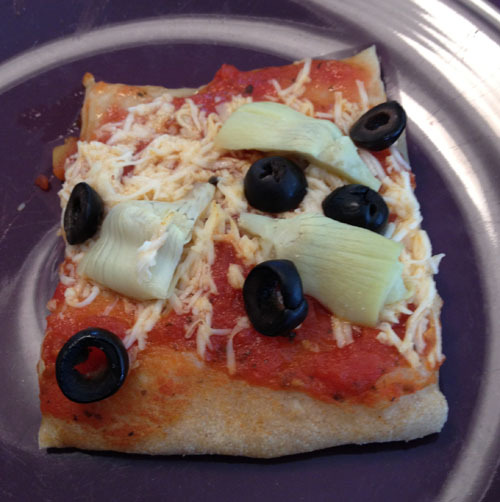 For lunch, I had homemade vegan pizza with my mom topped with shredded Follow Your Heart Vegan Gourmet Mozzarella, artichoke hearts, and block olives. 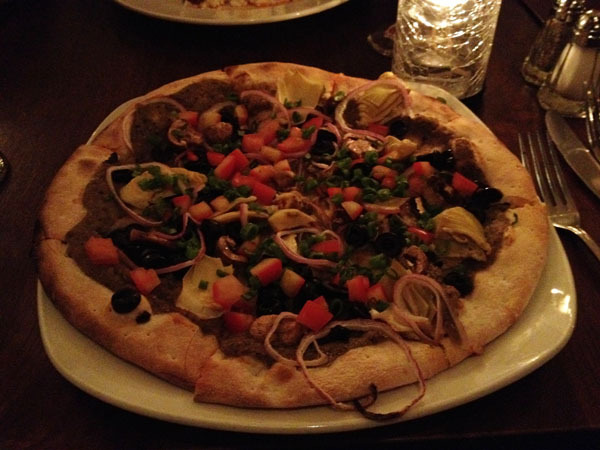 The Vegan Gourmet actually melted impressively well when baked on the pizza. 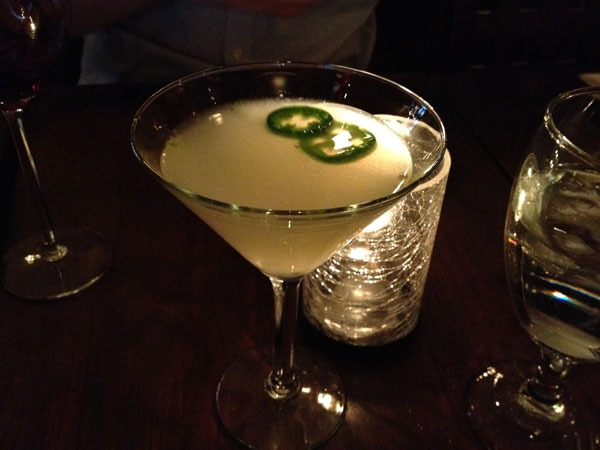 After work, hubby took me out to dinner where I started decompressing from the week with a jalapeno martini, a crazy mix of sweet, tart, and heat. 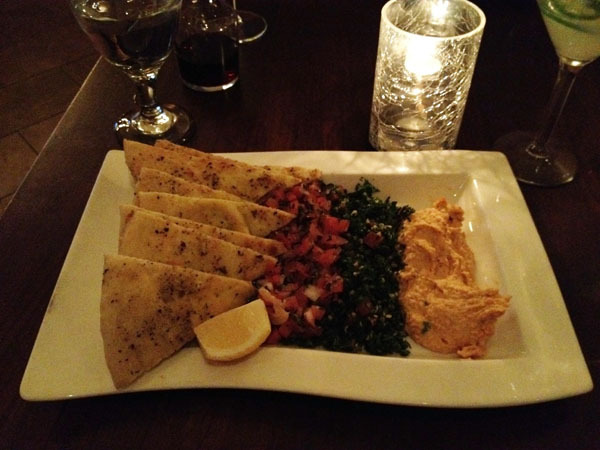 Then we shared a flat bread hummus platter, also amazing. Now I just need to motivate myself for a long run today, but it’s already overcast, windy, and drizzling out there – looks like I might be hitting the treadmill at the gym again. and i picked up that issue, too, and have been enjoying it! ooo that martini looks just about what I’d like right now…ignoring the fact that it’s Sunday. 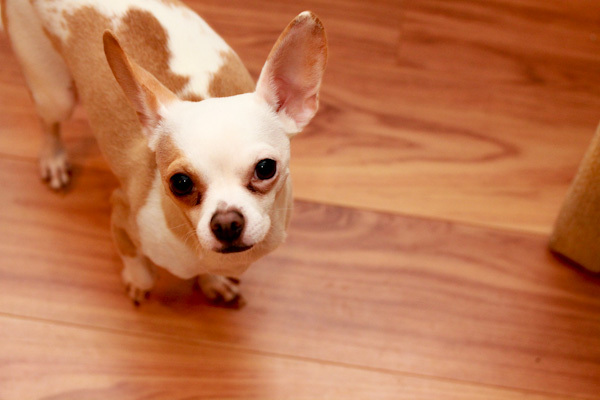 I just started reading your blog and love it! Hi and welcome! Thanks and the martini was awesome!